This park is the only remnant of the dev- astation from the 1964 Good Friday earthquake. The quake was measured at 8.4 & 8.6 on the Richter scale and lasted 4 minutes. The park was patented by the State to the Borough in October 1966. 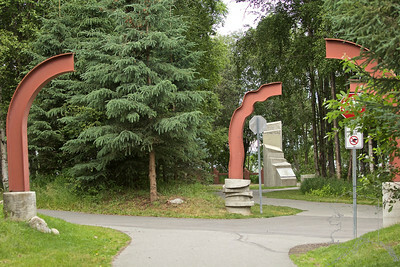 The park was named to honor those who died in the 1964 earthquake and dedicated in 1967. 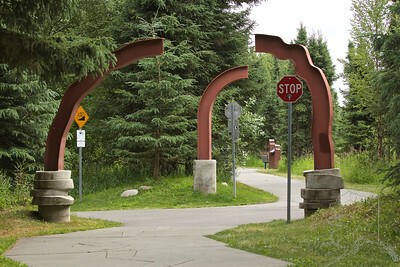 The park is a portion of the two mile slide area produced by the quake. In 1971 the Borough decided to keep development of the area to a minimum. Due to the bootlegger clay on the bluffs it was not a stable area. It was recom- mended that trails run from Earthquake Park to Pt. Woronzof for public enjoy- ment. The park was originally under lease to the city by the borough & was to be used for recreational purposes only. The property is very hilly, attributed to the fact the land broke into huge blocks dur- ing the slide. The bluff is 10 to 30 feet in height & is approximately 500 feet behind the former bluff. After much discussion it was decided the park should remain in its natural state & have minimal upkeep to keep it as is. It was recommended the only development be of the interpretative nature to show the force of nature on the area. In 1981 display panels were installed. 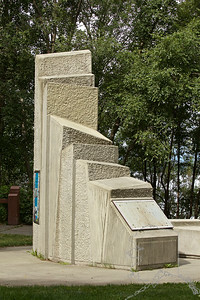 In 1997 a new interpretative display was created for Earthquake Park.